Traditionally, “Application Program Interface (API)” was a term known mostly within the developer community. Also, it would be rare to hear about a marketer or a financial analyst “working with APIs.” However, as technology continues to evolve, there are more data and ways to measure data. A particularly interesting topic – marketing technology – came across my mind, and after some research, I’ve noticed marketers were actually the largest consumers of APIs. I’ll first paint a landscape of the current martech ecosystem. Then I’ll explain with some examples of what those tools do and why a marketer would need and use them. 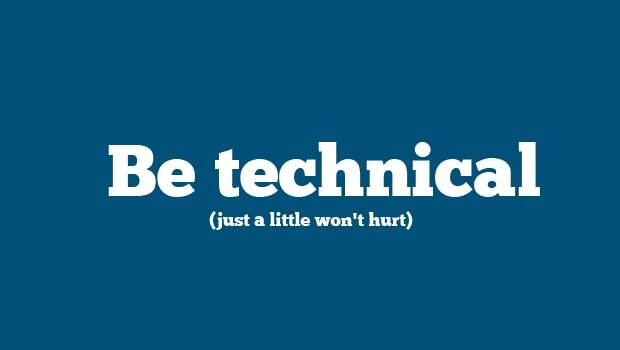 Lastly, how important it is to become a technical marketer in both knowledge and skill. I hope I can expose two audiences to learn about each other – developers and marketers. I would like developers to understand what you are developing for these marketers and how it impacts their decisions. On the flipside, I would like marketers to understand why understanding the underlying technologies of your tools and learning how to work with that data and future-proof your career. 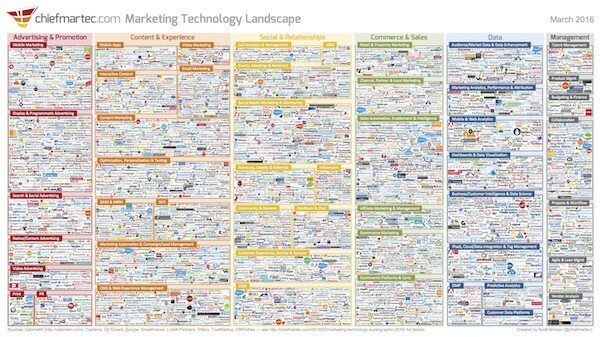 The landscape of marketing technology did not simply grow, it exploded. Look at this infographic of 3500 existing companies recorded since March 2016. It’s so packed you can’t really tell what’s what and it would be a game of find Waldo if I asked to point out company XYZ’s logo. According to the infographic’s source, there was an 87 percent growth from 2015 to 2016 – which means there were around 1870 marketing technology companies out there last year and we added 1630 to the ecosystem in a year’s time. With so many social media platforms, web analytics tools, marketing automation tools, and other tools for just about measuring anything else marketers are empowered with the freedom of choice. With choice comes variety and with variety comes complexity. In the next section, I describe how just Twitter created nice vendors and markets for Twitter data. Let’s use Twitter as an example to demonstrate how much marketing software surrounds this single social media platform. Twitter is an important channel for both B2C and B2B businesses to market and advertise on, and I will assume you already know what Twitter does. Guess what; there’s a separate tool for every single one of those bullet points and how do those tools work? Interacting with the Twitter API. There are ad management tools that let you manage and view ad performance on their own platform instead of using Twitter’s native UI. Why would you do this? Vendors can present data in a way Twitter wouldn’t show you, or they simply built a simpler way to monitor your performance. There are automated tools for growing your user base! One way is to auto follow and unfollow Twitter users with your specific targeting and user criteria. When you follow someone, it prompts a notification, and they can choose to either follow you back or not. There are SaaS that you can use to auto tweet to somebody once they followed you, have them go through a process to confirm they are not bots or even send out automated/scheduled Tweets. You can auto DM somebody who followed you or even segment your Twitter followers to send them specific marketing messages like if a user has #fintech in their bio, you can pull that user out and specifically send him fintech resources to look at. Social media management tools like Sproutsocial lets you see your own data’s trends, research about other topics, and even post straight from the platform. There are also SaaS out there that does hashtag analysis for you so you can provide the best visibility for your tweets. A product like Periscope is integrated within Twitter to let you live stream, there is a Twitter live stream API, and I’m sure Twitter streaming NFL games is through another system. Remember, this is all achieved by interacting with the Twitter API. Why do Marketers need all these tools? These types of tools enabled through the Twitter API empower marketers to work at a maximum level of efficiency. I’ve only highlighted how companies created tools that can maximize your potential for success on Twitter – don’t even get me started on other channels like Facebook, general email, and web analytics! Rather than scrolling through search results with tweets containing “#MuleSoft” and trying to piece together the volume of #MuleSoft month over month I can simply export it from let’s say keyhole in 10 seconds. One thing that we’ve seen as a trend is that there are tools out there that try be the all in one platform, but the multi-platform approach still rules. A company that has successfully done this so far would be Adobe Marketing Cloud where it houses tools for A/B testing, web analytics, mobile analytics, dashboarding, attribution, web development, and even more. But that makes sense since it’s an extremely expensive enterprise tool and they’ve built out the whole package for you, so they’re all interconnected. The list goes on, but you can see that each piece of marketing has its own tool, customized for a specific usage. Most of these martech companies invested heavily in integration so you can connect your marketing ecosystem with these. For example, you can integrate Marketo and Salesforce together to provide top-notch automation for your salespeople or even tie Tableau to Marketo and Salesforce to report out marketing and sales results. MuleSoft partners with major marketing technology companies to help enable this growing interconnected and intricate ecosystem of marketing software working together. See our Salesforce partner page and Marketo partner page. You might be thinking, great, this is complicated, and you must have a hard time keeping track of all those tools. Well, it is a lot of tools, but their uses are tailored for a specific solution. This space is also extremely competitive, so if you divert from your core offering, you’ll suffer a fate like Moz. Companies who came out and took advantage of specializing within a certain use case started having marketers look for the best vendors across the use cases instead of an all in one solution. 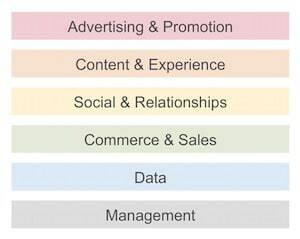 The chart above shows the main clusters as depicted from chiefmartec’s research bucketing the superior marketing technologies into six topics. Knowing front-end web development, equipped with SQL, R, or Python to analyze and clean data like never before, or understand data heavy tools like Google Adwords and Google Analytics. Armed with technical knowledge to understand how different marketing software work, how the integrations are executed, and what is happening behind the scenes. Number 2 is really important to start, and that’s where I advise. Especially with the trend of “Data Science,” I’m sure a ton of marketers are trying to learn R or Python. With those skills you can analyze clean Excel exports, but how do you free yourself from that shackle? 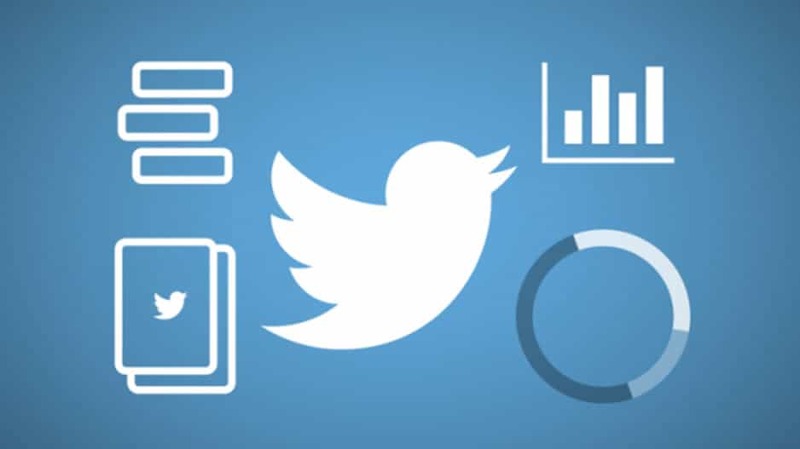 Grab Twitter data through its API and analyze within Python and even update it automatically. What about web data? Do you know how it’s captured? You see that there is a negative correlation between unique sessions and checkouts or bounce rate and email sign ups what does that mean? With the amount of data we are collecting from apps, marketers can’t continue to depend on Excel exports. In essence, understand how the data is captured, what are the ways to extract it that’s scalable (hint… APIs), and you’ll be an in-demand asset. You can start first by learning about APIs in this post: what APIs are and how they work. Also, please subscribe to our blog newsletter to stay up to date with the latest MuleSoft news and everything about connectivity!